Although it may be somewhat indulgent, and thin on plot, “Tusk” is a wholly original, completely entertaining, and totally insane new film from Kevin Smith. “Based on a podcast by Kevin Smith” isn’t exactly an auspicious beginning to a film about a man who is surgically transformed into a walrus. But here we are, one year after SModcast #259, with “Tusk,” Smith’s second foray into horror after 2011’s “Red State.” The film stars Justin Long as Wallace Bryton, an LA podcaster who hosts a vicious comedy show called The Not-See Party with his best friend Teddy (Haley Joel Osment). When Wallace is sent to Manitoba for an interview with the “Kill Bill Kid” (Doug Banks), a Canadian teen who accidentally cut off his leg with a Katana sword, he discovers an intriguing offer from a Mr. Howard Howe (Michael Parks) while in a local pub. Advertising a permanent living arrangement, Mr. Howe promises a roof to live under and many great stories to tell in exchange for simple household chores and errands. Wallace sets up an interview with Mr. Howe and travels nearly two hours outside of Manitoba to conduct it. When he arrives, he learns that Mr. Howe lives alone in a massive estate, secluded from the rest of the world. Howe tells his stories as promised, but when Wallace mysteriously faints in the middle of their conversation, he regains consciousness without any memory of what happened, or a left leg. It turns out that, in his many travels, Mr. Howe encountered a majestic walrus who saved his life at sea. Since then, he’s spent his entire life trying to recreate the bond he had with “Mr. Tusk,” and he believes that Wallace, with some minor adjustments, would make a fine companion. Through some mystical combination of Paddy Chayefsky, Jess Franco, and Tom Six, the result is “Tusk,” the most uninhibitedly insane movie of this, or any, year. The short answer is this: “Tusk” is a mess. Tonally, narratively, thematically, and visually, almost none of it makes any sense. But, instead of trying to level things out with some form of restraint, Smith seems perfectly happy to throw in everything including the kitchen sink. And his neighbor’s kitchen sink. And their neighbor’s kitchen sink. The long answer is that “Tusk” is both the best and worst thing Smith has done in years. Watching “Tusk” is not an experience comparable to any other film I’ve ever seen. Many of its scenes are objectively terrible, including most of Johnny Depp’s bizarro performance, but there’s something sickly fascinating about this film that kept my eyes glued to the screen, engrossed even when things veer off into overly indulgent territory. However, as lunatic as this film is, it features some of Smith’s best dialogue since “Chasing Amy,” including a “New Wallace vs. Old Wallace” monologue that may be my favorite scene in any film this year. It’s these low-key, dialogue driven sequences that keep “Tusk” from flying off the rails. Between the full walrus reveal and Michael Parks’ disturbingly manic performance, there were many moments when “Tusk” teetered the line between being ironically bad and truly unbearable. 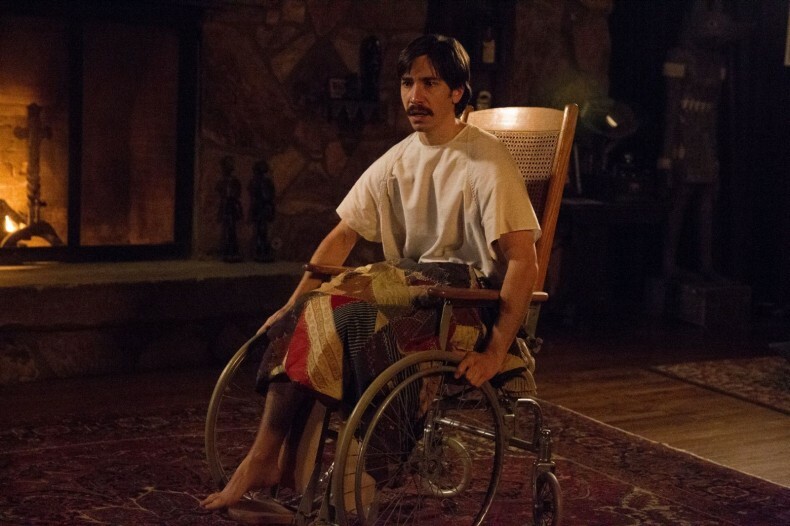 But Justin Long’s career-best performance and some of Smith’s most assured work behind the camera, and the keyboard, help maintain the balance that becomes crucial to “Tusk’s” likability. Haley Joel Osment and Genesis Rodriguez also give enjoyable supporting performances, and the film does right by not allowing Long and Parks to dominate the screen for the entire film. However, there are moments in “Tusk” where Smith doesn’t let his dialogue, no pun intended, speak for itself. Nearly every scene where Mr. Howe monologues about his life, it’s accompanied by an unnecessary, hammy flashback that detracts from the power of the words being spoken and the person speaking them. The only time where this doesn’t happen is arguably Parks’ best work in the entire film, and the rest of “Tusk” would have been better off leaving the flashbacks out, allowing Parks to keep the audience at the edge of their seats with every groan, grunt, and facial contortion that help flesh out the character and accompany Smith’s writing. “Tusk” is, arguably, a 75-minute film with 25 minutes of filler, but it’s filler written and performed by a group of people creating one of the most insane bedtime stories ever told. It doesn’t get any points for subtlety (Wallace and Walrus? Really? ), but Smith infuses each of his characters with enough substance to get great performances from his actors, as well as a no-holds-barred approach to the radical storytelling, and the result is one of the year’s most polarizing, unclassifiable films. “Tusk” is disturbing, hilarious, corny, stupid, brilliant, and infuriating. Walkouts and refunds are to be expected. But more than anything, “Tusk” is a whole sloppy mess of unbridled fun. "Run All Night" is a somewhat disappointing collaboration between Liam Neeson and Jaume Collet-Serra, who fail to recreate the compelling thrillers of their previous effort, "Non-Stop." As one of Disney's most ambitious films to date, this "kid's flick" has a hearty blend of laughs, tears, and superheroes that the whole family to enjoy.